We all have those abandoned socks that we think are of no use. 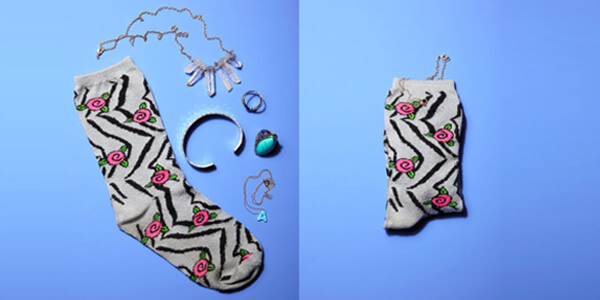 But instead of tossing them in the drawer, here are 15 brilliant ways in which you can put all the single socks to their best use. Use the sock to hold your accessories in place when you are traveling. This will also help you save a lot of space in the bag. To soften laundry without using fabric softener or dryer balls, take a couple of socks, put a tennis ball inside each, knot them, and throw into the dryer before running your next load of laundry. 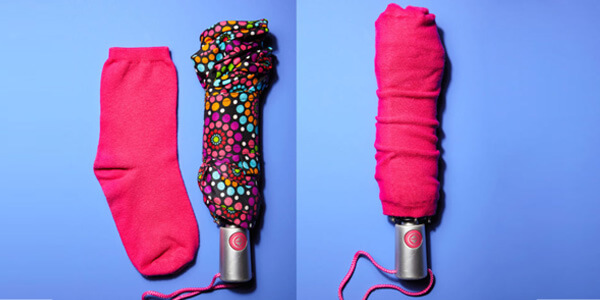 To keep the water from your wet umbrella dripping everywhere, cover the umbrella using a sock. This will keep places such as your car seat from getting wet. Slip your sunglasses or power glasses inside a sock to keep them from getting scratched. Save all your sports balls from getting lost. 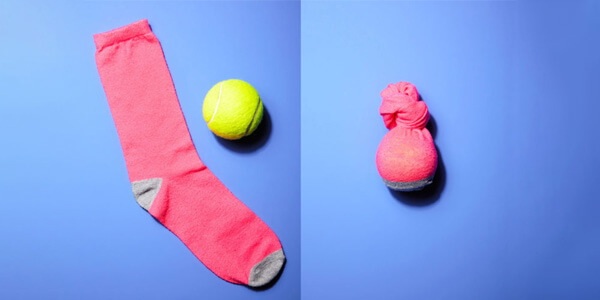 Keep any golf, ping pong, tennis ball or other small balls together inside a sock. This will also prevent the balls from getting dusty. 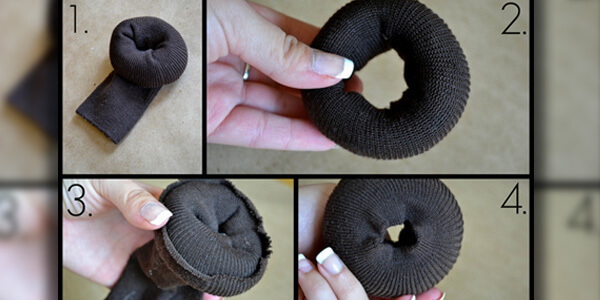 You can use the sock as scrunchie to tie up your hair in a neat bun. Cut the cuff of the sock to your desired size and shape and you’re good to go. Fill a plastic bag with ice and place it inside a sock to make a softer ice pack that you can use for pains that need a cold touch. 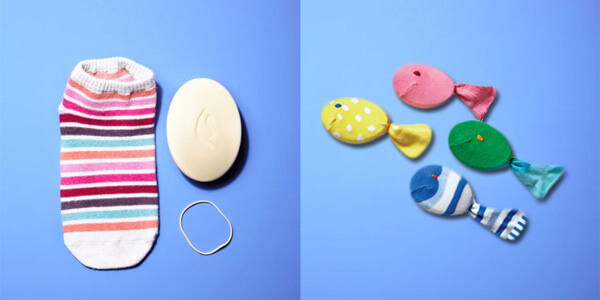 Since soap can be slippery for small hands, put the bar inside a clean sock and knot it to make it easier for kids to use. 9. Stubborn jars? No probs! 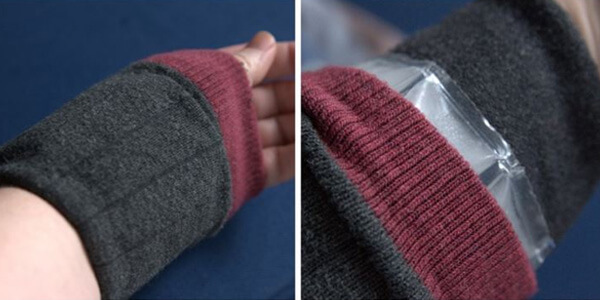 Use a spare sock as a grip holder when opening greasy and oily jars. Cut off the cuff of the sock and use it as a wristband. Don’t worry if it has a logo of the brand on it. The logo will make the band look much cooler. 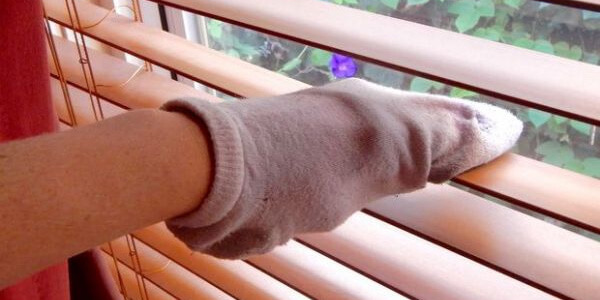 Wear the sock in your hand, wet it and use it to clean hard to reach places such as between blinds, along moldings and in corners. When your pet’s shedding season arrives and you can’t find a brush, put a sock on your hand, wet it, and use to remove excess hair from your cat or dog. Next time you’re gifting someone a wine bottle, wrap it in a cute sock and tie a ribbon on the neck of the bottle. This will give the bottle a nice cushion to hold. 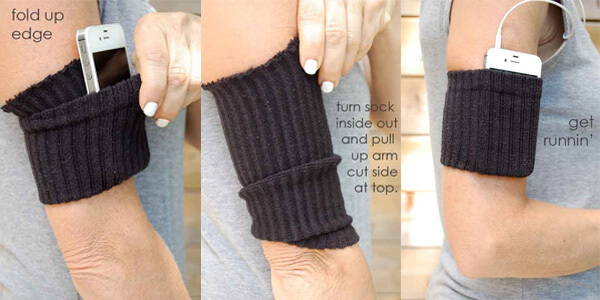 You can cut the cuff or the leg of the sock and use it as an arm band to hold the phone while working out. If you have a large sock at your disposal, use it as a holder for delicate items such as lingerie and napkins or use it to store stuffed toys.